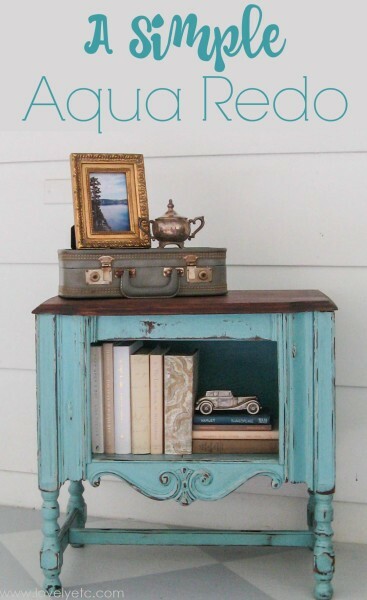 My favorite little aqua redo - Lovely Etc. I picked up this little radio cabinet at a massive yard sale earlier this summer. I really liked the shape but it was in terrible condition. Luckily, I was able to scoop it up for just five bucks. One of the huge problems on this piece was the dry, peeling veneer on top. I started to repair it with wood filler, but then seeing just how loose it was, decided to try peeling it off instead. I was able to scrape it right off using a paint scraper. 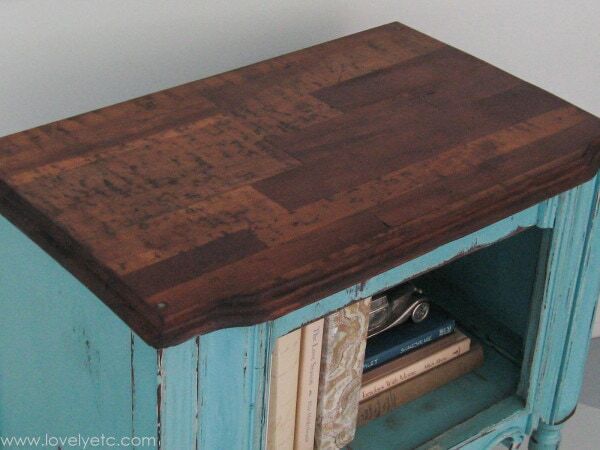 I got really excited when I found this unique hardwood top underneath – it is pieced together from strips of different types of wood. I’m sure it was never meant to be seen, but with a little stain, it was gorgeous! I decided to go aqua with this piece – my absolute favorite color. 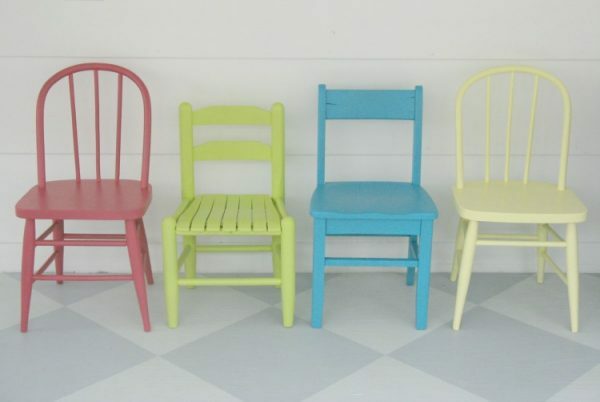 I didn’t use any fancy paints – just plain old latex paint. I sanded a few rough spots and then rolled on some primer. 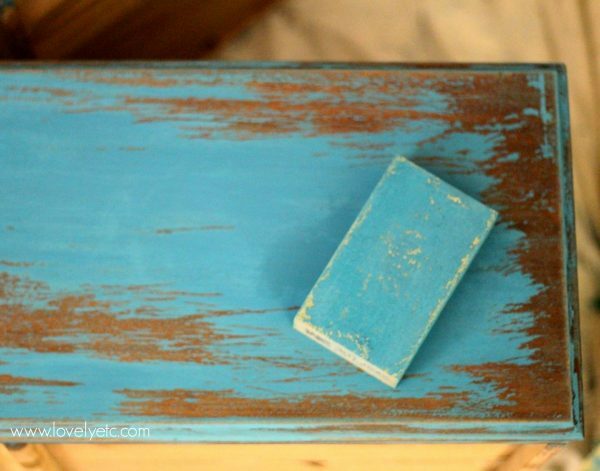 I painted it using a gallon of mistint paint I was lucky enough to find at Lowes for $5, but if you are looking for a similar color, it was very close to the color Aqua Ocean by Valspar. I used 100 grit sandpaper to heavily distress the whole cabinet, especially the curves and corners. 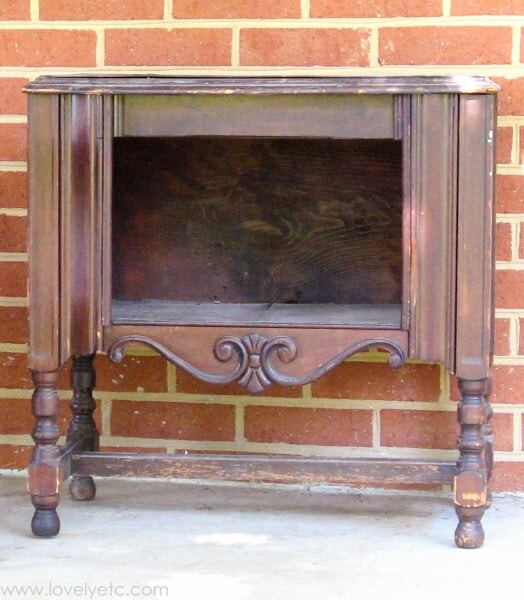 And then I used Minwax English Chesnut stain to give more of an antique feel. I wiped the stain on with a cloth in small sections and then immediately wiped all of the excess off with a damp cloth. There were some areas where the stain still looked ‘dirtier’ than I wanted so I wiped them down lightly with paint thinner. Of all the pieces I have redone to sell, this is the only one so far that I have had a hard time parting with. I thought about keeping it, but I don’t have the perfect place for it, so to the shop it went. This is beautiful! 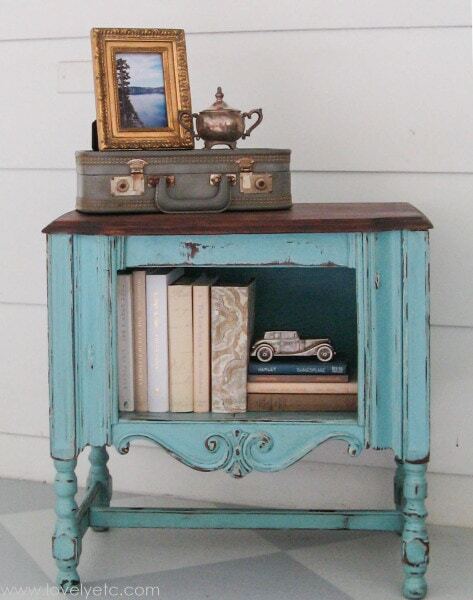 I have a tall dresser that I’m thinking of redoing in turquoise, I love the color but also afraid of it… it’s just so bold. I might give this technique a try. Love it! 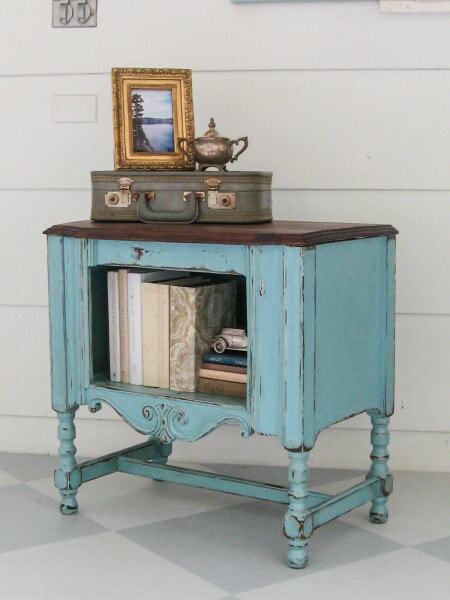 I am looking for something sort of like this but with two drawers on top and then two doors below….not as easy as I thought while cyber shopping! Whew! Amazing work! I love it. 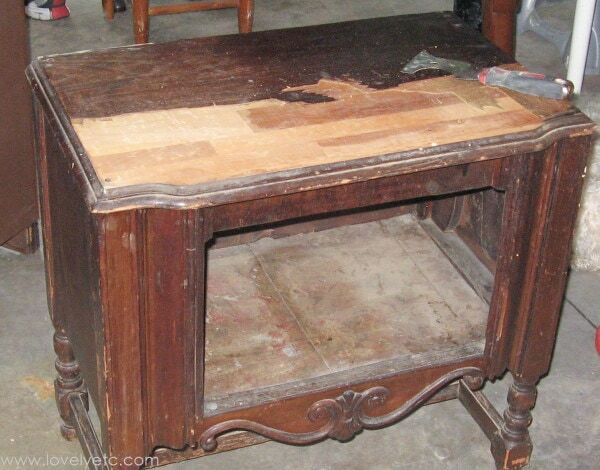 Would you mind sharing how you distressed the piece? Carrie, I love this piece. It’s beautiful and you did an amazing job bringing it back from the dead. I am featuring it on my blog tomorrow! Thank you so much for linking up to Get Your DIY On last week!! Hope you’ll join us tomorrow with your holiday signs. 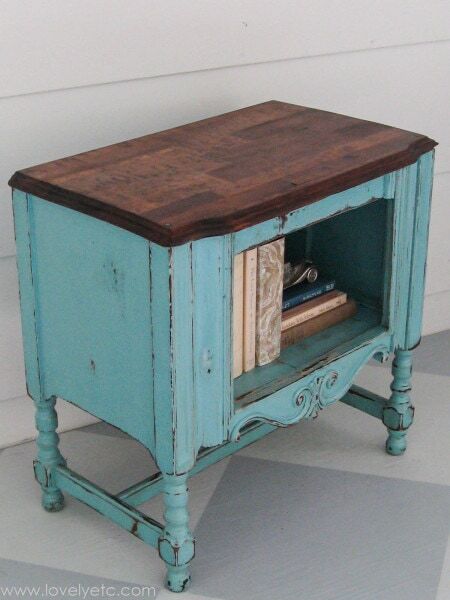 I love this little side table! And I love love love the color. What a wonderful find under the veneer! That is so cool. I dont know where you are located but any chance this piece is for sale?? It’s just what I’m looking for. Sorry, I sold this piece already. And to be honest, I kind of wish I still had it for myself! Really awesome transformation! Love seeing the process. I bet even if I saw the cabinet I wouldn’t have bought it like you did. It was under such a poor condition. But you did a great job. You should be proud of it :) The transformation is impressive. Thanks! It was just waiting for a little love! What a unique and beautiful piece of furniture. I love this color combination. Wow! That’s so great! Thanks for sharing. This is so beautiful! I love that colour! It’s gorgeous! A awesome transformation! Love the color with the dark top! love it. i am sure someone is still loving this piece. great color choices. Thank you so much! Sometimes I still wish I had this little piece! OMGorgeous! What an adorable piece and wonderful transformation. Thank you so much! It’s one of my favorites! Thank you so much Linda! And I definitely still look around sometimes and wonder if I could have found room! I have to tell myself I really don’t need ALL the things!